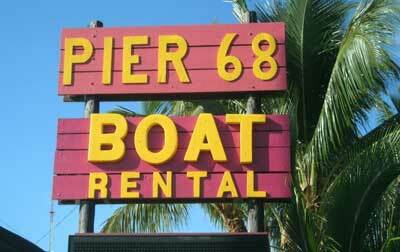 Thank you for checking out Pier 68 Boat Rentals. We specialize in center console, pontoon boat, deck boat and fishing boat rentals. Our family has been renting boats since 1986. We offer daily rates as well as multi day discounts and weekly rates. We also have reasonable monthly rates during the winter for our snowbird friends. At Pier 68 all of our boats are equipped with a fuel efficient Yamaha four stroke outboard motor. Each boat also has a ladder for getting in and out of the water. For navigation every Pier 68 rental boat is equipped with a color gps/chartplotter. Our deck boats and pontoon boats feature a bimini top for maximum shade and our fishing boats have a t-top for 360' fishibility. Most fishing boats are also equipped with a live bait well. Rod/reel rentals as well as frozen bait is available. Our pontoon boat rentals accommodate up to 10 people for a fun day of snorkeling, fishing, or just plain boating the waters of the Florida Keys. The fishing boats can get you to our great Florida Keys fishing spots by going under the Long Key Bridge, and you are fishing the Atlantic Ocean within 10 minutes of leaving our dock. Kayak fun for the family is also available at our rental business, Pier 68. Pier 68 also rents quality single and tandem sit on top kayaks by the day, week or month. Kayak delivery is available and our rates are rock bottom. Our staff will get you set-up with all your paddles and lifejackets. Rest assured, your Pier 68 Boat Rental will come equipped with all safety gear required by the Coast Guard. While our boats are not brand new we take pride in renting good, reliable boats at a reasonable rate. Pier 68 sells bait, chum, ice, accessories and fishing tackle. We also rent fishing and snorkeling gear. Our pontoon boats and fishing boats have bimini tops to protect you from the sun. Stop in at Pier 68 and have some fun on the Florida Keys water! We have the best prices for boat and kayak rentals. Pier 68 services Long Key, Marathon,Conch Key, Duck Key, Hawks Cay, Grassy Key, Key Colony Beach, Layton, Lower Matecumbe, Islamorada.